A complete range of products both for the filtration of coolant and for the air clean in the industrial working area, are able to solve all customer’s needs. Products’ high quality and reliability allow SEI FILTRATION to be supplier of the best and most important machine tool building companies. 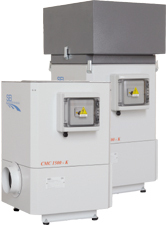 The new CMC series created from SEI represent a qualitative solution to eliminate oil mists, smokes and steam generated during working process using pure or emulsified coolant. The centrifugal air filter CMC-S series has the characteristic to aspire in vertical way, the tested SELF-CLEANING integrated centrifugal system, grants an efficient pollutants’ knock out at the source with continuous download of the oil condensed particles and therefore a remarkable reduction of maintenance operations. Additional filtration system are available (post-filter) granting a total cleaning (efficiency 99,97%) or activated coal, to eliminated dry smoke – burned oil – dangerous exhalations. 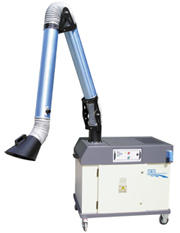 To eliminate oil mist, smokes and steam with small quantity of dust and abrasive. (Lathe – Machining Centre – Grinding machine – Gear machine – Cutting machine – Drilling machine – Tranfert machine – Plunge spark erosion). 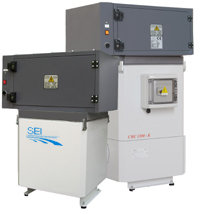 The new CMC series created from SEI represent a qualitative solution to eliminate oil mists, smokes and steam generated during working process using pure or emulsified coolant. The centrifugal air filter CMC-K series aspires in horizontal and have a pre-filtration room where a cell leaking for the first roughing out of the polluting one is lodged, the tested SELF-CLEANING integrated centrifugal system, grants an efficient pollutants’ knock out at the source with continuous download of the oil condensed particles and therefore a remarkable reduction of maintenance operations. – Limited investments scheduled in the time. To eliminate oil mist, smokes and steam also with more quantity of dust and metallic swarf. (Lathe – Machining Centre – Grinding machine – Gear machine – Cutting machine – Drilling machine – Transfer machine – Plunge spark erosion). 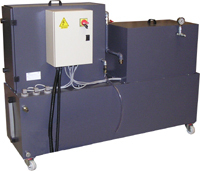 Unique filtration System equipped with electrostatic cells and centrifugal pre-filtration for shooting down the oil suspension. This system allows to reach high performance filtering very atomized pollutants. In addition to the atomized mist it allows to destroy burned oil smoke with 99,99% efficiency. Indicated during working process using pure oil. Possibility to control the filters’ stoppage through signal devices. QUALIFIED TO: To eliminate oil mist, smokes and steam also with more quantity of dust and metallic swarf. (Lathe – Machining Centre – Grinding machine – Gear machine – Cutting machine – Drilling machine – Transfer machine – Plunge spark erosion). Completely self-working equipment, with a SELF-CLEANING cartridges filter. Our filtering units are equipped with electronic signalling devices able to check continuously the good functioning of the whole and to control the cartridges filters’ stoppage. QUALIFIED TO: Dry dust (without use of coolant liquids). Mobile aspirator on trolley qualified to oil mist,oil smoke, welding smoke and dry dust. Particularly indicated for all those situation where a fix aspiration point is not required, are placed for the application of an articulated supporting aspiration arm. Completely self-working equipment, easy to be moved inside the working areas. Possibility to control the filters’ stoppage through signal devices. Available in two models with different filtering concept and four version. – AF. T pocket filter for oil smokes, welding smokes and dry dust. – AN. E electrostatic cells filter for welding smokes, microfog oil and burned oil. QUALIFIED TO: Dry dust – dry smokes – oil mist. Consisting of filtering units with capacity from 3000 up to 6000 m3/hour, they allow the connection with several machines tool. Thanks to the use of these modular units, based on the specifici customer’s requirements, we are able do develop centralized solution also of medium and big size. Our filtering units are equipped with electronic signalling devices able to check continuously the good functioning of the whole suction system as well as the filters’ stoppage level. QUALIFIED TO : Oil mist, oil smoke, dry dusts. 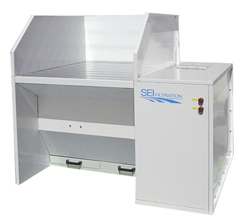 The downdraft table BA Series offers a working area constantly vacumed and protected. Rigidity and low noise makes them ideals for manual operation link polishing, grinding, deburing and welding for also bigger size parts. Available in several models and sizes they could be equipped with their own filtering system or connected to a centralized unit. M Version with mechanical filtration and C Version with SELF CLEANING cartridges filtration. A complete range of accessories are available in order to customize this equipment, to specific user needs. (Suction back panel, adjustable lateral screen, illumination system, top enclosure made in transparent and protective material). 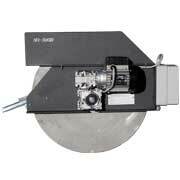 They allow to keep a high level of cleanliness in the machine shop work environment. Allow to carry out safely, the cleaning and drying of parts by compressed air. A removable drawer helps collecting metal scraps and draining residual fluids, avoiding the diffusion in cleaned areas. Ergonomically designed, with illumination of work area, and transparent protective screen for operator safety and also completely soundproofed to reduce the noise pollution. They are provided in a foot mounted version and on trolley for easy handling to the required working area. The blowing benches are preset for vacuum of the working area, to remove fog and oily vapours generated during the parts blowing stage. This system is used for the filtration of pure or emulsified coolant with a maximum viscosity of 20° cSt at 40°C, contaminated by both magnetic and no magnetic particles.The coolant to be purified is distributed through a dedicated diffuser on the filtering fabric, an electro-mechanical system automatically recognize that the fabric is saturated and provides new fabric restoring the filtering process and downloading at the same time the mud into a collection tank. The percolated liquid falls into the tank of the clean coolant and through a relaunching pump will be sent to the machine tool. During this operation the filtration cycle is never interrupted. A double filtration is obtained combining two different filtering systems: ST and SM. This combination increase considerably the requested filtration level reducing in the meantime the consumption of the filtering fabric. The SM cleaner acts on the magnetic particles contained into the coolant and the fabric concludes the process catching all other pollutants. The high filtration performance and the possibility to combine different sizes, give the STM series a big versatility. This system use a permanent magnetic field like a filter. All metallic impurities are collected from the rotating discs and than automatically removed trough proper stainless steel blades (mud scratch blades) and than unloaded into the mud’s tank. The percolated liquid falls into the tank of the clean coolant and through a relaunching pump will be sent to the machine tool. The magnetic cleaner does not use filtering materials to be wasted and allows the differentiated removal of the waste. The SM-C series is equipped with a rear jet-breaker diffuser which decreases the incoming speed of the dirty coolant into the magnetic divider. Born with the technological evolution of the machine tool’s high pressure working process, are equipped with sophisticated control systems of the filtration process. The coolant is purified flowing through several (regenerable) cartridge filters and released to the machine tool with an high pressure pump. This cleaner is equipped with a filter stoppage alarm as well as with a solenoid valve for the manual or automatic exchange of the filters. During this operation the filtration cycle is never interrupted. Available with pressure till 70 BAE, they grant high filtration value to the coolant (till 5 micron) especially for precision working. For heavy processing or by the presence of elevated quantity of solid pollutant, generally are preceded by magnetic or textile pre-filtering stages. Qualified to: all machine tools using high pressure coolants (spindle’s internal feeding). With oil skimmer SO-N series your coolant fluid will last longer. Hydraulic oils combined with processing residues, build up on the surface of the coolant tanks and prevent the fluids from being oxygenated. This results in a gradual deterioration of the fluid’s chemical-physical equilibrium, a loss in the lubrication and cooling properties of the fluids and give out nasty odours. The band of the skimmer’s Serie SO-D, partially submerged in the fluid, collect floating oil on the surface. Appropriate scratch system provide the unload of the reclaimed oil into a collection tank. Ease of installation make this oil skimmer suitable for application to existing systems as well. It is possible to plan the oil divider’s functioning based on the needs of the machine tool, optimizing the filtration process. – decreasing the tool’s wear. With oil skimmer SO-D series your coolant fluid will last longer. 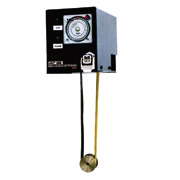 The oil skimmer’s rotary disk SO-D serie, partially submerged in the fluid, collect floating oil on the surface. Appropriate scratch system provide the unload of the reclaimed oil into a collection tank. Available in two versions using a disc ø 300 and ø 500 mm., can be fitted to all kinds of eater-based fluid tanks. 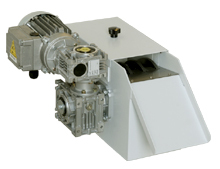 Ease of installation make this oil skimmer suitable for application to existing systems as well. Non-woven fabric has been used in the mechanical industry to filter coolants on automatic, pressure and vacuum filters. 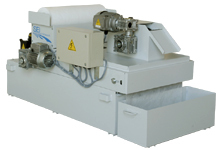 Non-woven fabric must meet the specific demands of the each single application. 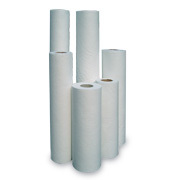 Type of fluids, flow, degree of filtering, viscosity, temperature and concentration of the pollutant, make is possible to choose the most suitable type of non-woven fabric to obtain the best filtering result at the lowest plant operating cost. Available in standard rolls 100 m length in the following width: 500-700-1000-1400 mm.